Northwestern Vermont Board of REALTORS Releases July 2012 Market Statistics The Northwestern Vermont Board of REALTORS has released its real estate market statistics for July 2012. The information is derived from data contained in the Northern New England Real Estate Network and covers Chittenden, Franklin and Grand Isle Counties. New Listings in the three county region decreased 5.2 percent to 236 listings. Pending Sales were up 34.8 percent to 178. Inventory levels shrank 18.1 percent to 1,173 units. Prices moved higher. The Median Sales Price in northwestern Vermont increased 2.9 percent to $249,950. Days on Market was down 1.7 percent to 95 days. 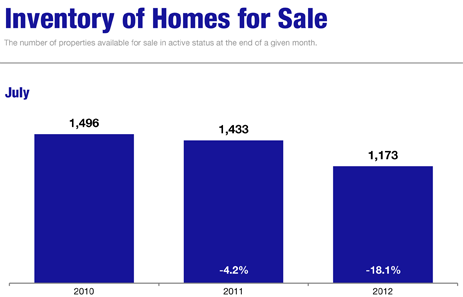 Inventory continues to creep down. Buyers and sellers are positioned right now for attractive transactions. said Kathy Sweeten, executive vice president of the Northwestern Vermont Board of REALTORS. Strong activity is being reported in all Chittenden, Franklin and Grand Isle Counties. Contact us for more information on Vermont's real estate market. [gallery] Contact us or call today for an appointment to see this BRAND NEW HOME! 482-5232 or 453-5232 Learn more about this listing here!